YOUIE | What Does YOUIE Mean? 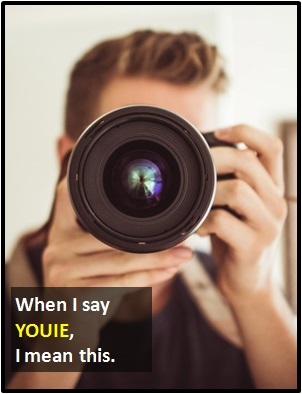 YOUIE means "You Selfie." A YOUIE is a selfie of another person. (So actually, another word for a YOUIE is "photograph"!) The term exists because it is a comical way to describe the opposite of a SELFIE. The image shows somebody taking a photograph of somebody else. Person A: Can you take a YOUIE of me infront of the penguin enclosure? The term YOUIE is an amalgam of the words "you" and "selfie."